WEST GREENWICH, R.I. — Rhode Island began charging tractor-trailers to drive on Interstate 95 on the morning of June 11. But while opponents rallied against a tolling scheme they call unconstitutional, it is unclear when — or even if — a long-threatened legal challenge will come. In the three years since state lawmakers began debating the truck toll proposal, the trucking industry has called it unfair and warned legal action is likely once tolls are charged. Asked to clarify whether truckers are backing down from a lawsuit, Maxwell told The Journal that court action is “more than likely,” but that strategy is being formulated by the national parent of the trucking association in conjunction with other policy and political fights. 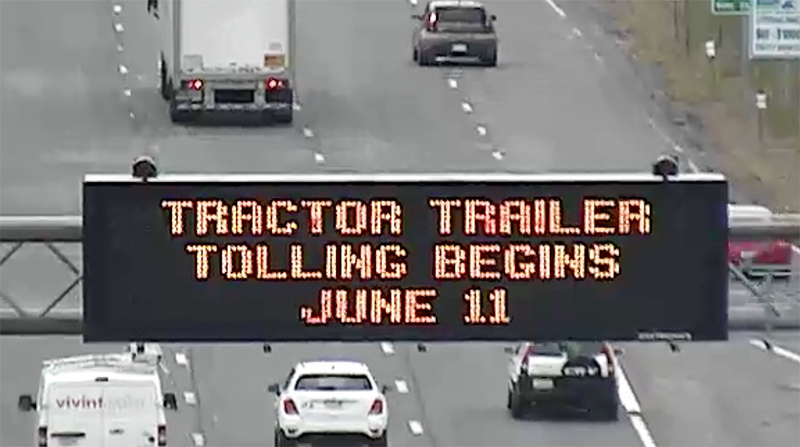 After roughly two years of planning and development, the Rhode Island Department of Transportation activated the first two truck tolls early on the morning of June 11 on the southern stretch of I-95 between Exits 2 and 5. It culminates a lengthy effort to get businesses that move goods across the state’s highways to finance construction and repair of those highways. As expected, it set off competing media blitzes seeking to either demonize or normalize the tolls. Gov. Gina Raimonodo’s administration fought back. With toll opponents expected to attack, the DOT this month launched a television and radio advertising campaign to defend the tolls to residents. The pro-toll media offensive — including three weeks of air time on four television stations and eight radio stations — will cost $61,800, according to St. Martin. The expenses will come out of the DOT’s operating budget. Now that the first two tolls are up and running, the state expects to add a dozen more sometime next year. When fully operational, the full truck toll network is expected to generate $45 million per year. St. Martin said the DOT has applied for federal environmental approval of the remaining tolls and, pending that green light, hopes to have them up and collecting sometime in 2019. As truckers complained that being singled out for tolls is unfair, they have also warned that the industry will soon start driving around Rhode Island or on secondary roads, causing state revenue estimates to come up short.